Coneteboy is back, this time with a great review of the variant Thing from ML2. Check out the 'flashing' picture below - one of the best I've seen in ages! 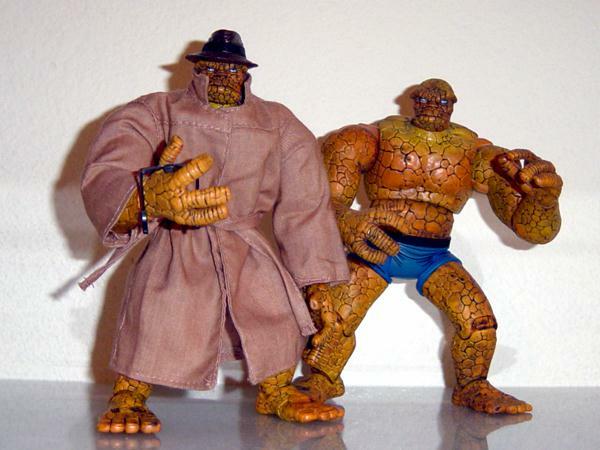 For fans of Toy Biz's incredible action figure line based on their favorite Comic Book heroes and villains, VARIANTS have been one of the most annoying toys to get a hold of. But for those who actually have success in finding these elusive figures, it may be one of the more satisfying items to add to the collection. 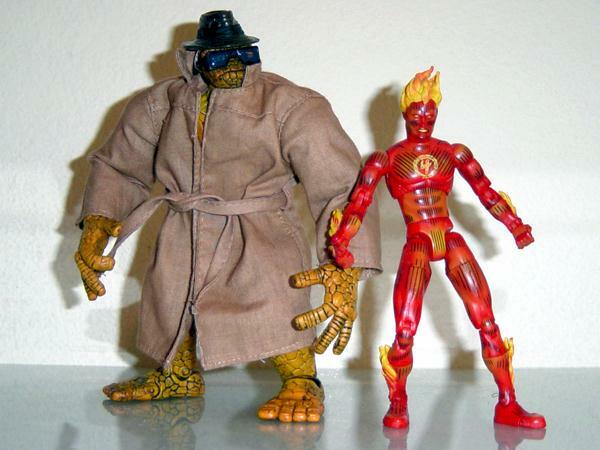 Every series of the Marvel Legends have had more than its fair share of variants, but just for fun, let's recap the more obvious variants that have surfaced. Series 1: HULK w/ articulated fingers, HULK w/ shirt, Iron Man Gold, and Stealth Iron Man. 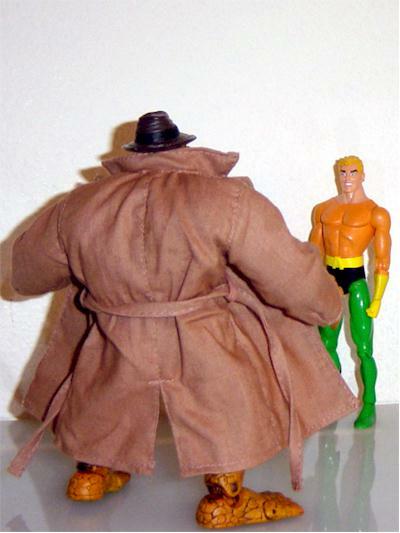 Series 2: THING w/ trenchcoat, and Dr. Doom Doombot. Of course there are plenty more variants that include posters instead of comics and color changes and such, but to find them all would be harder than moving objects with your "force powers" (yes, really). Fortunately, I was able to find a few of these at my local Wal-Mart (after giving up hope) and also a few others with the help of some very kind toy folk. 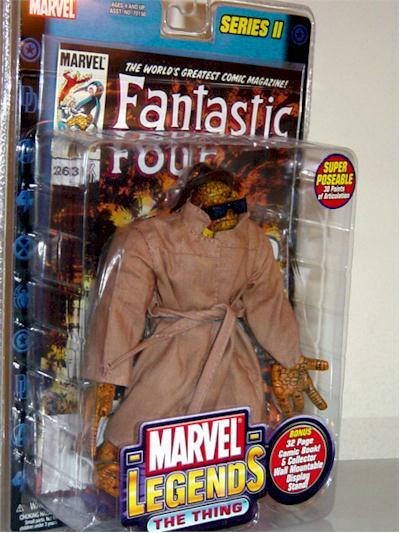 Today's variant for review is The THING with his trench coat disguise. Basically the same as the regular release but with accessories! Kinda makes you wish they all came with trench coats! The clam shell packages are standard issue for Marvel Legends and this is essentially identical to the normal THING, even the comic book remains the same. The sculpt underneath the additional accessories is one exceptional figure. There probably isn't another figure in the line with this much attention to detail. Just looking at the individual stones that stretches over the entire figure is more than enough to make you appreciate the work that goes into the figure. There are literally thousands of sculpted stones on THING's body. Even the expression on this guy's face is incredible. Toy Biz did a smashing good job here. You'd think that with that much attention to the sculpting, that the figure would be one solid shade of orange with black cracks. 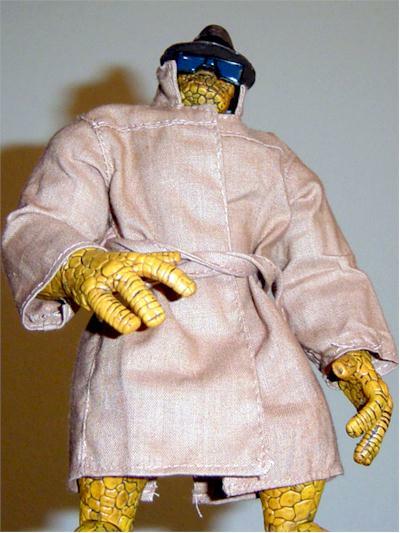 No sir, Toy Biz takes an extra step and gives the entire body a weathered look so that it looks like the THING means business. The paint ops are excellent all around. The eyes and line work are extremely clean; it's close to perfect. The one change that I'd like to point out can be seen on the trunks. The standard THING has black trim on his shorts. The variant THING features a white trim. For a figure of this size, it's certainly refreshing to have a load of articulation as well. There's a ball jointed neck that allows a better than decent range, ball jointed shoulders, additional movement behind the shoulders, elbows and knees, wrists, upper torso, waist, cut thighs, heels, toes, and bendie fingers (that's 20 points right there alone!). The fingers of the hands are all bendable and much more effective than the initial HULK fingers. 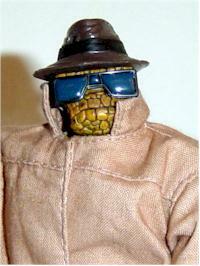 There are three accessories, which is three more than the regular THING - trench coat, sunglasses, and hat. The removable trench coat is exactly what you'd hope it would be. Looks great and relatively easy to remove and put back on. The hat is sculpted to fit THING's head but doesn't stay on too well if his head isn't positioned straight. The sunglasses are also kept on via clear rubber band. Without it, the shades would not be able to stay affixed to his head. The comic is a reprint of the original, and is identical to the previous THING release. For a figure that is selling under $7 at retail, it definitely is a terrific buy. But since this certain variant is so difficult in locating, the price will range from $12-35 depending on where you make the purchase from. I definitely wouldn't mind paying a tiny bit more than retail to obtain this figure, especially since it comes with additional accessories that are removable. If you do pay more than $15, you can start taking off a full star and keep going until it hits two stars. 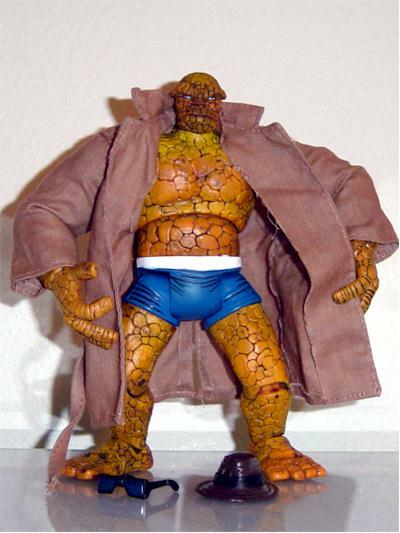 If you're a fan of The THING, then there definitely shouldn't be anything holding you back from getting this figure. Unless of course if they short pack the hell out of this variant and even limit the stores that carry it. This is one of the greatest Marvel Legends figures made but it is rather disappointing that they made a variant that offers so much more than the regular issue for the same price. Other than that major setback, this is a terrific toy. Variant THING has been seen in Wal-Marts for under $7 and in scalper's hands for as much as $35.